2. High Fructose Corn Syrup (a Genetically Engineered – GE – food) is as recognizable and common to the average American as good old ketchup. 3. 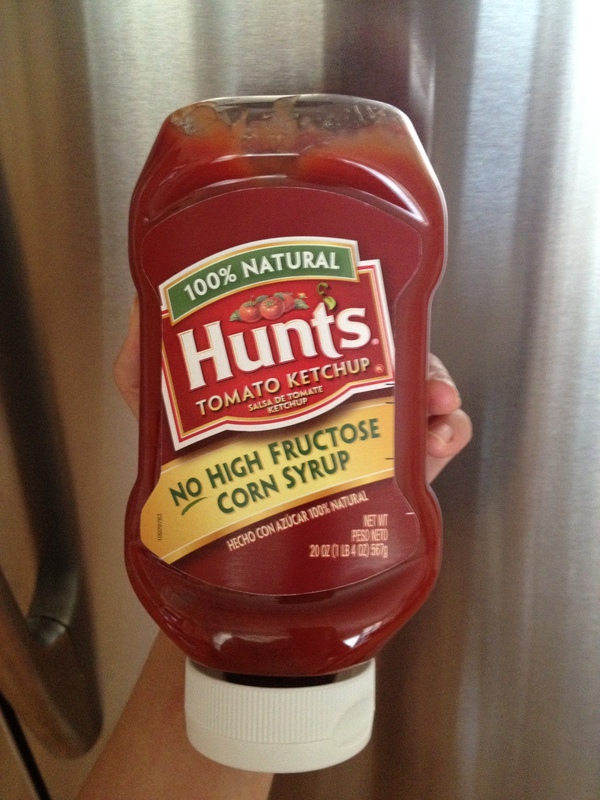 If Hunt’s can make ketchup without High Fructose Corn Syrup, why don’t the other guys? 4. I should make my own ketchup, then I won’t have to worry about GEs. 5. Is this a small victory over GEs or just clever marketing for an ultra-processed product? 7. So why don’t they just label it? My husband and I have this conversation all the time! We use Annie’s Ketchup as well as a couple of other organic brands… but I think we are gonna start making our own…. In case you’re interested, here’s a recipe for a curry ketchup-I am definitely making this in the future! Thanks Noelle! My sister-in-law has a recipe too, but curry ketchup sounds so interesting. You’ll all be hearing about it if I try it. 😉 Thanks! How does it taste?? I’m especially curious because I despise Hunt’s ketchup. And now I’m blanking on the non-fructose corn syrup one that I like. Maybe the Heinz organic? I’m appalled! Never thought to look for HFCS in my low-salt Heinz ketchup!! AAuugggh!! Thanks, Ra. This is probably getting overly-paranoid, but as much as I’m glad public awareness of HFCS is building (even though it seems like most people have no idea why they’re supposed to avoid it, I’m glad they are), I always feel wary when the big companies start promoting “No ______!” It always feels like misdirection. Like you say, if it’s that easy, why aren’t they all doing it? What are they doing instead? Etc. Have you seen the pro-HFCS commercials? They’re jaw-dropping. I completely agree. That one label on a lowly ketchup bottle made me question so many things about the way our food is mass produced. I already knew about GMOs and am wary of HFCS, but I’m not sure what that label really means for us. I’m seriously going to make my own ketchup though. Problem solved. I JUST saw one of these commercials this weekend. My jaw DID drop. Funny thing is, I have seen them before years ago. And they were oddly comforting to me back when I didn’t think much about food. I found a website this weekend too: http://www.sweetsurprise.com Check it out and prepare for your jaw to fall off.